Ely & Co's unique baby sack surrounds your precious baby boy in the perfect sleep apparel. Crafted from the softest fabric, 100% natural cotton, this wearable sleep bag is lightweight and composed of breathable material. Machine washable for busy moms, this sack has easy and simple care. Our baby boy wearable blankets are handsomely packaged and make wonderful gifts, with two sacks in each box. 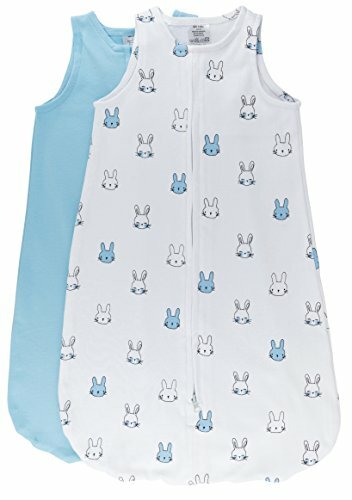 One Wearable Blanket is a beautiful solid, light blue color; the accompanying sleep bag has a delightful pattern of white and blue bunnies on a white backdrop. Ely & Co's sleep bag is designed with comfort and convenience in mind. This wearable blanket keeps baby comfortably warm all night long, while eliminating the danger of loose blankets getting twisted, tangled, and covering your child's face. An easily accessible bottom zipper enables quick diaper changes, while the round neckline with a soft-tab front ensures a cozy, relaxed sleep space for your special baby boy. If you have any questions about this product by Ely's & Co, contact us by completing and submitting the form below. If you are looking for a specif part number, please include it with your message.